Virtual reality and augmented reality are no longer science fiction. Once the subject of futuristic novels, television, and movies, VR and AR markets are expected to reach $27 billion in 2018. Not only do these areas have the interest, but they have the investment and, soon, the impact, particularly in the workplace. The two related markets represent two very different business uses. Virtual reality is completely immersive, taking the user into a fully-articulated digital world that doesn’t interact with your current physical environment. Augmented reality is a blended experience, putting a digital overlay on the real world and improving your current physical environment. Google glass would be an early AR product, while classic black-out goggles would be a VR product. AR and, in particular, VR have been around for decades, but a few recent cultural developments are making their moment now. True to Moore’s Law, the form factor of tech processors has gotten significantly smaller over the years, and today’s devices can fit safely and comfortably on a user’s face without excess heating or weight. It also reflects our post-smartphone world, as we’ve become accustomed to carrying powerful devices with us as we go about our day. It is a small leap from walking around with a smartphone using live GPS to donning a pair of glasses to do the same. AR and VR bring remarkable new benefits to the modern workplace. First, workers have an unprecedented ability to collaborate. There have been workarounds with collaboration, like screensharing and virtual conference calls, but these new technologies create a truly unified view co-workers can see at the same time despite their location. They also create a smarter, safer environment to view and strategize. Today, we’re seeing how drone technologies are able to survey the landscape of, say, an active volcano or a perilous skyscraper and bring the operator precious information on the area. In the near future, AR and VR will enable us to take that data and work within a simulated environment with a realism closer than any other tech. It’s not just a matter of comfort and safety, either. 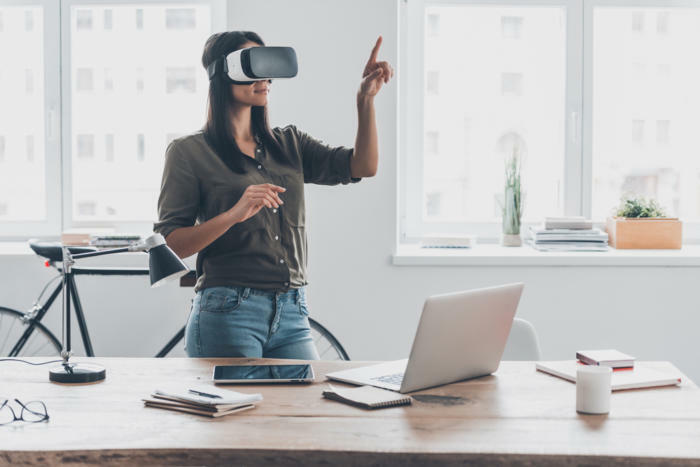 AR and VR can help bridge the gap between different workplace generations, connecting the freelancing Millennial working from home with the veteran Baby Boomer in the office. They all have the opportunity to be looking at the same goods with the same viewpoint without being in the same room. And, despite being cutting edge, AR and VR will save companies significant amounts of money. Both technologies already give employees fully-interactive offices – reach your hand out to grab a document and your virtual document will rise to your eyes, for instance. The physical space, hardware and other modern necessities will be taken to the virtual realm, as will the recyclable (and non-recyclable) waste we create in our offices every day. For example, voice controls can be used in conjunction with hand gestures, eliminating the need for a mouse, controller, or, eventually, even a desk. The ability to move, open, and otherwise interact with computer files with physical motions means users can go through a digital, online archive as easily as a tactile one – perhaps even eliminating the need for paper storage. The opportunities are as endless as our innovation. Technologies like AI and VR are quickly becoming mainstream, accelerating the transformation in the way work gets done. Though still early in the adoption curve, research shows we’re on the cusp of a wave of adoption. Voice recognition, chatbots, recommendation engines have proven the competitive advantages bestowed by these technologies. Which is why “AI will be ‘actively implemented’ in their companies within the next three years, according to 75% of surveyed executives,” according to an Economist Intelligence Unit report. To learn how cutting-edge technologies like AI, ML and VR can play a part in driving workforce enablement, and how Dell EMC can help, click here.